Posted By:LovelyLocks | At:8:27 PM Be the first to comment! This past Sunday on Savvy's radio show, Brother Otis referred to me as gangsta boo. While I am certain it was not an insult, I'm not quite sure it was a compliment. You see, I tend to speak my mind... frequently...especially when I think that people are trying to manipulate a situation or person purely for their own benefit. I call it the "let me pee on your head and tell you it's rain because I think you are too stupid to recognize the urine smell" manipulation. And quite frankly, it makes me very angry. I understand that it is human nature to want people to agree with you or to feel the same way about a subject that you do but when you lie/cheat/or bamboozle a person into seeing things your way, you really haven't won anything. Know why?? Because eventually someone else is going to come along and say, "Hey that guy is peeing on your head. You're okay with that? You didn't smell the urine?" And then you not only lose an ally, you actually gain an enemy. I have just come to the conclusion that, in general, Black women just have a preference for Black men. And I am okay with that... Like all little Black girls, I too grew up dreaming of the day that I would raise a strong, loving Black family of my own... Along the way, I have dated outside my race...not because it was my preference but because I felt like Black men are allowed to keep their options open, so why shouldn't I?? And so I dated even though I knew that secretly, I still desired a Black family. And then it happened. 2007 rolled around and politicians around the country started making themselves very visible in hopes of clenching the Democratic nomination and I heard tale of this charismatic senator from Chicago, Illinois and the intelligent, fashionably styled Black woman he called wife. I still remember the first time I saw a picture of the Obama family. Something about the easy smiles and obvious affection they all felt for each other and suddenly all seemed right with the world. You, see, as Americans we have just come to expect that Black families will be portrayed a certain way. If we see a successful Black man, he's usually holding the hand of a white woman in society page pictures. If, heaven forbid, he married a Black woman, hey always seem to photograph them a little differently. He either looks very unhappy or like he's very distant from his significant other. But the Obamas were DIFFERENT from the very beginning. He always seemed happy to be with her. They would often be seen whispering together and sharing private jokes. I called my mother immediately after I saw that picture and said, "Whoa, I can't wait to raise my strong Black family." (She was extremely pleased to hear that since she had been hounding me about settling down and making grandbabies) And I KNOW that I was not alone. 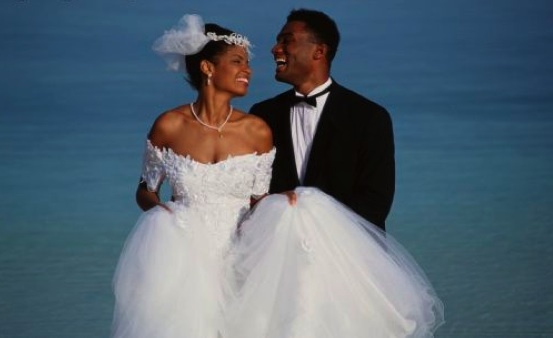 Black women and even some Black men all over America "exhaled" at the sight of the Obamas and what we felt they signified for Black marriage and Black families. And no sooner than we took that breath, the American media sat about trying to destroy our happy thoughts. If they weren't telling us that Black women are somehow less attractive than all other races of women on the planet, then they were explaining to us how there are no good Black men left so we better hope and pray we could find us a white man to rescue us from dying alone. When these "news"stories didn't have their desired effect, the media shifted gears. Their new strategy? Now they want us to believe that Black men simply don't want us. In the last week and a half, I have seen interviews with supposed Black celebs that make me wanna throw my tv out of the nearest window. Last week, Isaiah Mustafa (the Old Spice guy who is now a regular on the new Charlie's Angels series) told E-news host Giuliani Rancic that he wants a woman that can give his children good hair because his own hair was not good. Pause for effect-- I cannot make this stuff up people-- If you don't believe me--google it. Now, quite frankly, I find it hard to be "offended" by other people's stupidity. And this statement was just STUPID on his part. The funniest part of all is that Mrs. Rancic had no idea what he was talking about as evidenced by her follow up question. She asked him if the hair had to be real and he was adamant that it did. What I'm guessing is that he didn't realize was that the woman he's speaking to (like many other white women) wears so much weave that there is a horse running around with a bare behind just so that she can have mid-back length curls. Ahhh but the media couldn't just let it go at that. Nope. Next, while Taye Diggs was out promoting his new children's book which supposedly teaches kids to tolerate each other's differences, he proudly proclaimed that his mother told him she always knew he was gonna marry a white woman. Now I won't lie. I have just come to expect this kind of foolishness whenever Taye Diggs opens his mouth...it is certainly not the first insensitive comment he has made about Black women. According to him, Black women don't like him because he married white. The truth is, Mr. Diggs, I never cared who you married, I don't like you because you say stupid things. Now at first, I was angry with these men because I feel their comments were asinine. But then I noticed something.... Common, the rapper, has been interviewed extensively over the past 2 weeks because he is promoting his autobiography. Although, his past relationships play a central role in his book, only one interviewer has asked him about what "type" of woman he wants. And that was Wendy Williams. So I can't help but wonder if the mainstream media has failed to ask him the question because it's quite clear that Common loves him some sistas in all shapes and sizes. Well to the American media, I speak for all Black women when I say please stop peeing on our heads and trying to convince us its rain... we smell the urine!!! I am not arrogant enough to sit here and tell you who you should and should not marry. The choice is yours and I truly hope you do whatever makes you happy. But, I am tired of the media trying to make us feel as though we're not worthy of the happily ever after. They can keep the Isaiah Mustafa's (by the way Isaiah...ALL HAIR IS GOOD HAIR ... oh and I'm a Black girl wit waist length hair...and it's all MINE) and the Taye Diggs of the worls because for every one of them there is a Common, a Denzel Washington, a Will Smith, a Samuel Jackson and yes even a Barack Obama who are going to keep showing the sistas love and we are gonna keep loving them right back! !